Most people using GIS or remote sensing data came across the data obtained by the landsat satellite family. It all started with the Landsat 1 mission on July 23, 1972. The Landsat missions aquired millions of pictures which made available to public usage in 1992. Sensors developed and provided more and more details in terms of spectral and ground resolution. The multi-spectral scanner (MSS) was followed by the Thematic Mapper (TM) with Landsat 4, which was planned to be replaced by the ETM -the shortest- mission of Landsat satellites (Landsat 6). The latest mission of Landsat 7 with the Enhanced Thematic Mapper was a good start but had some problems after May 31, 2003. It all led to one of the longest lasting satellite objects in the orbit of the earth: Landsat 5 which stopped aquiring images after 2012. The Landsat Data Continuity Mission (LDCM) has the goal to provide high-class multi-spectral images like Landsat 5 and 7 have done in the last decades. This will giv us the opportunity to see global change, landscape evolution, urban sprawl, melting glaciers, reforestation and othe great things that are hard to monitor by not looking from above. Both systems operate on the LDCM spacecraft. The temporal resolution provided by the spacecraft is still the same compared to prior missions: one picture every 16th day for approx. 10 years. Bands of OLI and key figures: band names, cw, bandwidth, gsd, SNR (credit: Edward J. Knight, Brent Canova, Eric Donley, Geir Kvaran, and Kenton Lee (Ball Aerospace & Technologies)Corp.
. The cirrus band is for cloud detection, the coastal/aerosol of course for athmospheric studies as it covers ultra-blue wavelengths. 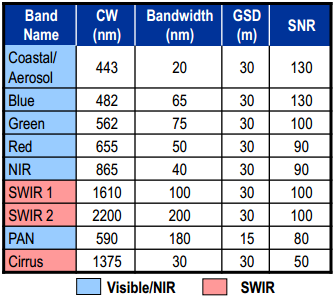 Additionally the ShortWave InfraRed (SWIR) bands are no longer covered with 60m ground resolution but have 30m. I’ve collected some key literature you might be interested in here. Most of these articles are available for free.